I love setting goals. Attaining them … that’s a different story. I’m always looking for new ways to increase productivity and accomplishing those goals. I recently stumbled across Zig Ziglar’s ‘Goals’ audio book. It was good. I think stumbled across his performance planner. It was good. 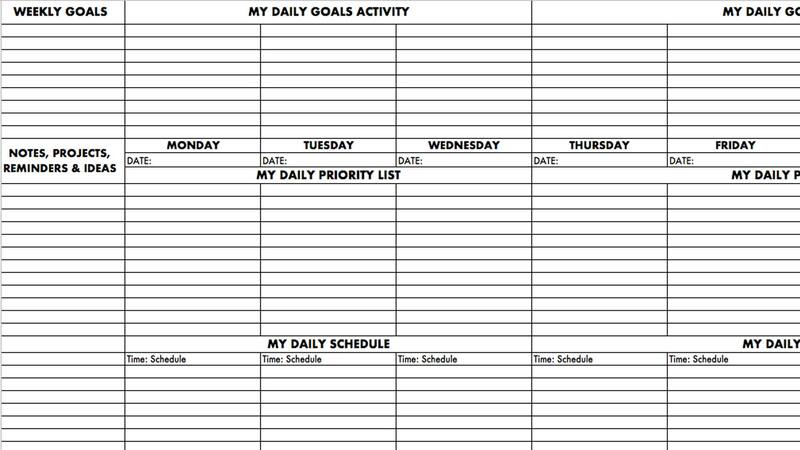 I decided to hack his system and create my own performance planner. Write down your BIG weekly goals. In football terms, these are you big plays, your hail marys. Each day you will write down what you’ve done to accomplish that goal. Simple, eh? Next you have your Daily Priority List. These are your blocking and tackling of the week. The small tasks you need to complete each day. Then we have your ‘Daily Schedule’. This is for time tracking. In football terms this is your play-by-play of each day. Physical Activity. Healthy body leads to a healthy mind leads to productivity. I recommend 30 minutes per day. The 8 dimensions of life. I got this from my mentor at Leadership Design Group. What I’m looking at here is that each day you try and hit each of the dimensions. Whether that be family, social, spiritual. Work/Life balance can happen but what I am looking for is a balance throughout the week. Well, there you have it. Simple, actionable.